1. Take the money you’d normally spend on gifts and donate it to a charity in the names of your usual holiday gift recipients. Send them a card letting them know you’ve done this. 2. Invite friends for a Solstice feast on December 21st instead of a traditional Christmas dinner on Christmas Day. 3. 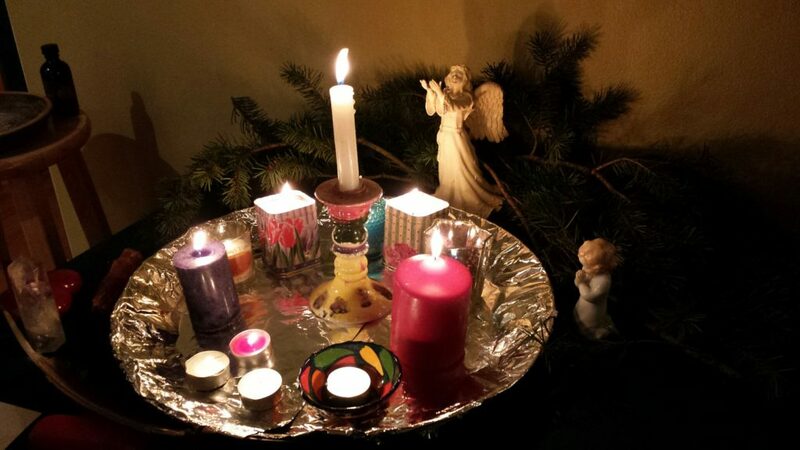 After dinner, pass a tray of candles around and ask each person to light one and make a statement about how they intend to bring more light into their lives during the coming year. 4. Have a Solstice tree instead of a Christmas tree, and decorate it with appropriate symbols such as stars, moons, snowflakes, lights, berries and lots of sparkly, sun-related objects. 5. Meditate! Light candles, breathe deeply and feel how you’re connected to the earth and to the universe. 6. Worship the sun. Take a Caribbean vacation or build a sundial in your back yard. The sun is what the "Christmas" season is really about. 8. Volunteer to help serve Christmas dinner at your local homeless shelter. 9. Visit someone in a nursing home or hospital and bring them some homemade goodies. 11. If you must give gifts, wrap them in newspaper, maps, scarves or interesting fabric rather than commercial wrapping paper. 12. If you have a special skill, teach a class during the holiday season each year.